Jose Padilha’s remake of Paul Verhoeven’s 1987 tech-noir classic RoboCop is almost here. Next week we’ll learn whether or not this worth our time, or a huge waste and another toothless remake of a movie we love. With the release date fast approaching we’re getting a rush of new RoboCop propaganda, including two new behind the scenes featurettes that dig into the technical and ethical ideas from the new film, and a video that catalogs all the faults and flaws of the original outing. Yahoo debuted this two part look at the technology of RoboCop called “Man and Machine.” As with most looks behind the curtain, these videos are a mixture of footage from the movie and interviews with key members of the cast and crew. In addition to Padilha, you hear from stars Joel Kinnaman, Abbie Cornish, Michael Keaton, and Jackie Earle Haley, as well as various producers and off-camera players. “I didn’t really know that The Dark Knight was PG-13 as well, I didn’t know what you could get away with with PG-13…. after seeing what we got away with with PG-13 that battle became quite irrelevant. And the original RoboCop by Verhoeven, he has a very specific idea when it comes to violence and how you portray violence. I mean, he grew up in the whirlpool of WWII and was very affected by that, and he had this idea that when you treat violence way over the top it becomes comedic. After delays, angry fans of the original, and some promos that left us cringing in fear for what is in store for us, Jose Padilha’s RoboCop remake is almost here. With less than two weeks to go before we find out if this is a worthwhile revisiting of a modern classic or a complete pile of garbage, Sony has released another two TV spots, one domestic, one international. This first new video definitely wants to highlight the action component of RoboCop. Let’s hope there’s more substance to this than just non-stop high-octane shootouts and robot fights. Though robots fighting robots is always a promising place to start, we’d like to see some actual character and story. That would be nice. From what we’ve seen, and what we know about the plot, we get the impression that this iteration of RoboCop is more human the first, more aware of who he was, and has more of a connection to his family. If nothing else, at least they’re trying to do something different. We’ll have to wait and see if it works out, but kudos for the attempt. That snarky little dig at the upcoming high-profile remake of Paul Verhoeven’s 1987 cult classic RoboCop kicks off the teaser video above for a project called, simply, Our RoboCop Remake. Not that RoboCop remake. Not the one with the dude from The Killing and the visor that won’t slip flip-flopping up and down and up and down and up and down. 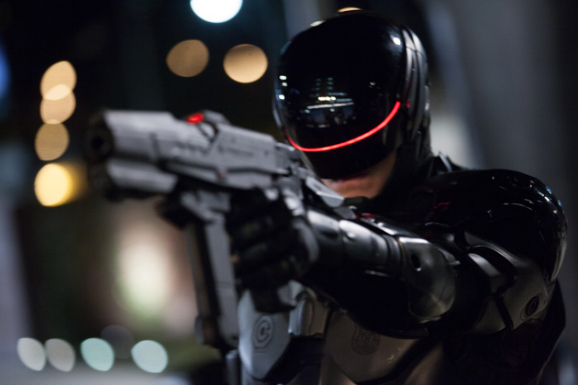 No, Our RoboCop Remake doesn’t need drones and black tactical armor and Michael Keaton. It just needs a brain trust of devout RoboCop fans and filmmakers on a mission to chop up Verhoeven’s film and have those pieces remade by a bunch of different people in a bunch of different ways. In two weeks, the RoboCop remake will make its way into theaters across the country. Many of us are preparing by watching Paul Verhoeven’s original. It’s going to be hard for fans to separate the two movies, but the filmmakers and producers knew what they were getting into, and expect the comparisons. While the 1987 original is dark, gritty, and grimy, the new version looks slick and glossy, with a certain shine that is somewhat appealing. To get you ready for the remake, Sony released a ton of new images from the film that features the title character in action, as well as the film’s ensemble cast. 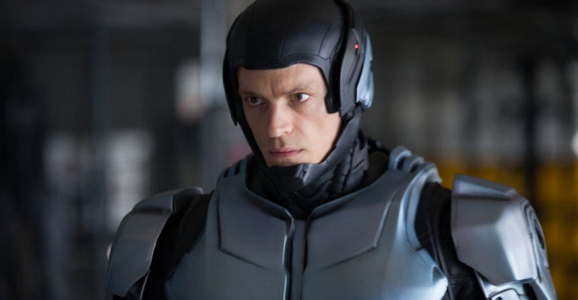 RoboCop fans had a lot to say last year when pictures of Joel Kinnaman in the remake’s redesigned black armor first appeared online — most of it bad. But while the cracks about Robo raiding Batman’s wardrobe were entirely valid, the reboot did at least give Officer Murphy a new set of wheels in the form of a sleek black motorcycle. And while Paul Verhoeven’s original film has plenty of things to recommend it, Peter Weller’s RoboCop had to tool around Detroit in a lousy 1985 Ford Taurus. 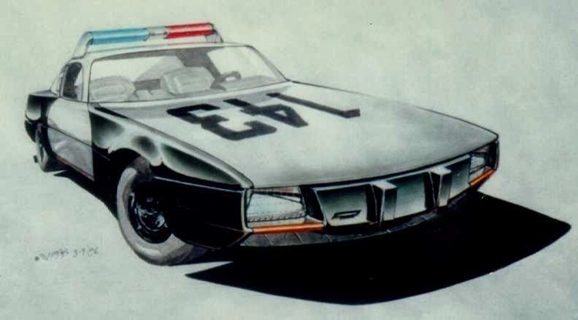 But did you know that he almost had his very own unique “TurboCar?” That may sound like something created to sell toys, but the original RoboCop really was set to give Murphy his own equivalent of the Batmobile, and you can see the final design for the vehicle above. Unfortunately, director Paul Verhoeven replaced the TurboCar with the generic Tauruses at the last minute. Why? Read on.